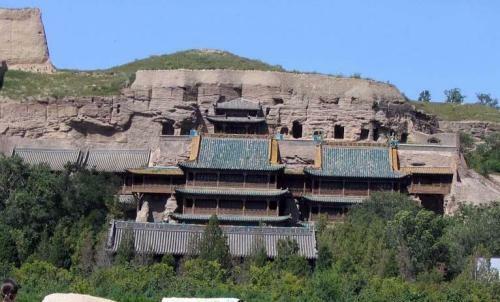 Situated in the southwest of Datong, Shanxi Province, Huayan Monastery, named after the Huayan sect of Buddhism, is a complex of the Upper Huayan Monastery (Shang Hua Yan Si), also called the Great Temple of Treasure(Da Xiong Bao Dian) and the Lower Huayan Monastery (Xia Hua Yan Si). Contrary to the splendid Upper Huayan Monastery, the Lower Huayan Monastery, constructed in 1038, has a touch of quaintness, where Buddhist scripture are stored. The Trinity Buddhas comprising the Past Buddha, the Present Buddha and the future Buddha are enshrined and worshipped here. Around the sides of the Trinity Buddhas.Huanyan temple shows the artistic style of the Liao and Jin dynasties. Its construction broke the rule of facing south, as it faces east. According to the story of Khitan of the five dynasties, “three thousand li north of youzhou, there is a town called Xilouyi where all the houses face east.” Khitans regarded east as superior and prayed to the east on the first day of every lunar month. It was following this rule that Huanyan Temple was built. The Daxiong hall of the temple is the main hall of the temple and is also one of the biggest in china, covering an area of 1559 square meters. The hall is splendid inside; five stately and golden Buddhas sit on the altar. On the walls inside the hall there are murals about the story of “preaching nine times in seven different places. The patterns of the embellished ceiling are different from one another and are magically beautiful.